A Camper So Cute I Could Pinch Its Cheeks | Life. Realized. 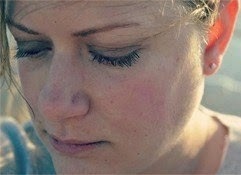 I would not classify myself as someone who enjoys confined spaces. Especially when other people are involved. I am more of a "personal space" kind of girl. My husband would testify to that fact in a hot second. 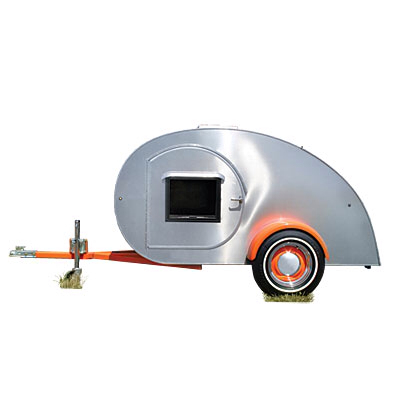 However, this trailer has me rethinking my idea of camping. I might just be willing to put up with the close quarters for the opportunity to snuggle up in this little cutie. Although after a long weekend of becoming one with nature, it will likely end up cute and stinky. That is a risk I am willing to take. My yard MUST look like this some day. I am pretty sure my husband has always harbored a deep seeded dream of selling off all our belongings, buying an Airstream, and driving around North and South America. While I'm not quite there yet, I do love the feel of the open road. This little guy wouldn't necessarily be appropriate for long trips, but it does in some ways epitomize my idea of what life will be like once we are empty nesters: intimate, free and serene. Of course that's just an ideal, but my husband and I will be sending our son off to college before we turn forty, giving us plenty of time to enjoy our relationship like most of our friends did in their twenties, before they had kids. That is not to say we don't enjoy our relationship now, we definitely do, but because we were young parents our relationship has involved little alone time for the most part. Every once in a while something like this trailer infuses a little excitement into the prospect of our relationship being more about us and less about carpooling. We are in no rush to see our little man grow up (most of the time), but we can still dream about our future, can't we? I first became acquainted with this little nugget when a friend posted the photo above on her Pinterest board, which then posted it on Facebook. I'm so confused. I don't have a Pinterest account, nor do I know much about it, so I took to Google (which I do understand) to find out where this picture originated. 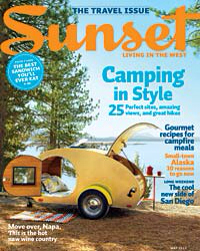 As it turns out, the May 2012 issue of Sunset Magazine featured this trailer on its cover, along with an article entitled "Glam camping: Rethink the pitched tent." 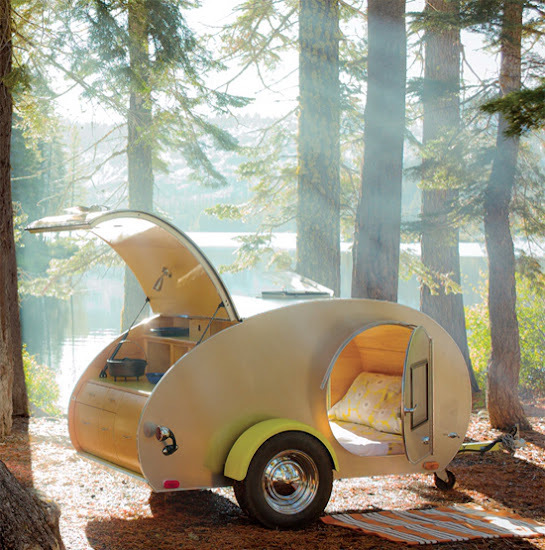 There is actually a company in northern California that custom makes these, known as Teardrop Trailers, which were popular in the 1960s. The company, Vacations in a Can, also rents them. I hail from SoCal and my husband's company is also headquartered there, so we visit the West Coast a lot; making this doable. 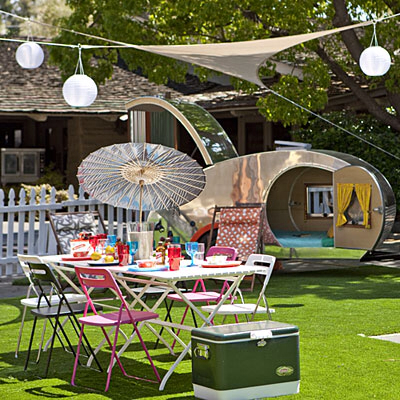 This trailer will definitely be the newest edition to our vision board. We don't actually have one, nor have we seen The Secret for that matter, but if we did it would be on it. For now it's on our mental vision board. How cool would it be to go camping with your partner in one of these?! That's assuming you're fond enough to get this close.